1-4 Amphispyris aff. zonarius (Haeckel); 1, oblique apical view, VSR-106b, 1-3cm, V30/2, 300x; 2, dorsal view, VS-R-106a, 1-3cm, O40/0, 300x; 3, ventral view, VS-R-92b, 1-3cm, D17/3, 300x; 4, dorsal view, VS-R-34a, 3-5cm, X9/3, 300x. 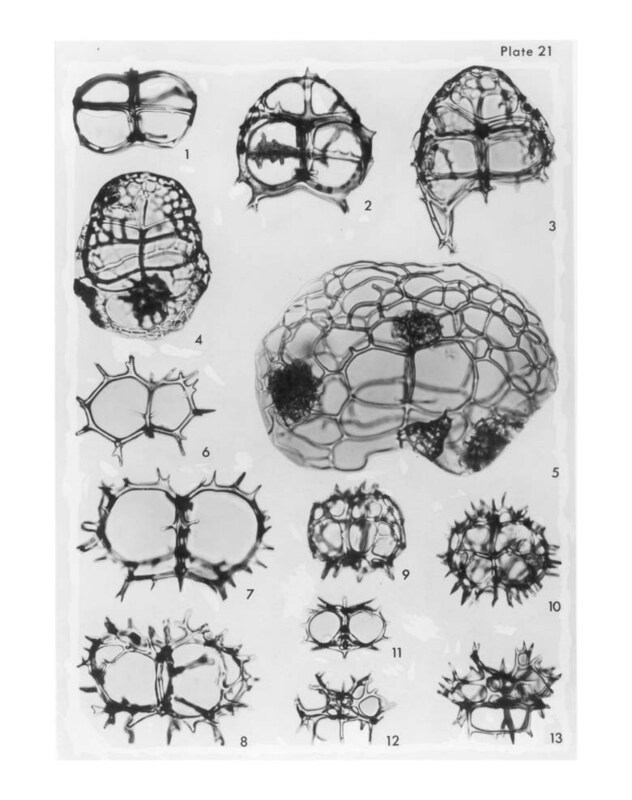 5- Nephrodictyum renilla (Haeckel); dorsal view, dark areas are radiolarians, VS-R-60a, 3-5cm, U21/1, 210x. 6-8 Eucoronis nephrospyris Haeckel; 6, apical view of basal (collar) ring, VS-R-106b, 1-3cm, L31/3, 300x; 7, dorsal view, VS-R-81a, 1-3cm, H43/0, 300x; 8, ventral view, variation of frontal ring, VS-R-71a, 1-3cm, W32/3, 300x. 9-10 Eucoronis sp. ? ; 9, ventral view, VS-R-92b, 1-3cm, S54/4, 300x; 10, oblique view dorsally and from below of basal ring showing the short primary lateral spines originating from the median bar in the lower center of the photograph, VS-R-93b, 1-3cm, V40/2, 300x. 11-13 Clathrocircus stapedius Haeckel; 11, ventral view, VS-R-81a, 1-3cm, F20/1, 300x; 12, basal view showing collar pores, VS-R-81a, 1-3cm, F20/1, 300x; 13, apical view showing dorsal "handle", VS-R-133b, 1-3cm, D30/3, 300x.